Gordon Brown: "We have spent the right sums of money"
A lack of helicopters is undermining UK forces' operations and troop protection in Afghanistan, according to an influential committee of MPs. The Commons defence select committee says commanders "have to use ground transport" - with worrying effects on protection of personnel. It says the government should buy new craft, rather than revamping old ones. 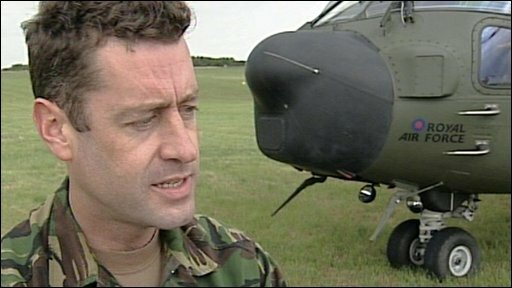 Defence Secretary Bob Ainsworth said he would "flex every muscle" to ensure the UK had maximum helicopter capability. In a Commons debate on Afghanistan, Mr Ainsworth said he would try to "squeeze more" out of every helicopter now at the UK's disposal and make extra ones available as soon as possible. But he warned the mission in Afghanistan would continue to be hard and people should be "braced for further casualties". Critics have claimed troops are ill-equipped. Chairman of the cross-party defence committee, James Arbuthnot, said: "Operational commanders in the field today are unable to undertake potentially valuable operations because of the lack of helicopters for transportation around the theatre of operations. This report will certainly be unwelcome news for the government but it stops short of explicitly saying servicemen are dying in Afghanistan through a lack of helicopters. It does, though, level a number of serious criticisms which could only be addressed by spending a lot more money. The cross-party committee of MPs that wrote it are rightly reluctant to get drawn into party politics over this issue. But their most important finding - that operational commanders in the field are unable to undertake potentially valuable operations because of the lack of helicopters - will likely be seized upon by the government's critics. Beyond Westminster, what the public are most likely to remember from this row is the fact that the head of the Army, General Sir Richard Dannatt, admitted to travelling round Afghanistan in an American helicopter because no British one was available. "We are also concerned that operational commanders find they have to use ground transport, when helicopter lift would be preferred, both for the outcome and for the protection of our forces." The MPs acknowledged that closer working between the military and defence equipment industry had allowed more flying hours per helicopter. The government also currently plans to extend the lives of ageing Sea King and Puma helicopters. But the committee says this is not the best solution operationally or in terms of value for money and that buying new helicopters is a better option. "The Ministry of Defence (MoD) should seize the opportunity to recognise the importance of helicopters to current and contingent operations, and work towards strengthening all aspects of capability," Mr Arbuthnot added. The report had been brought forward in time for the Commons debate. During the debate, former defence secretary John Reid said ministers must keep an "open mind" on whether troops had the resources needed to fulfil their objectives. "When you ask young men and women to risk their lives on the front line we must make sure we have the resources to limit those risks." Mr Brown says it is "absolutely clear" the heavy loss of life in recent weeks was not due to a lack of helicopters. But the Tories said it was "irrefutable" that a 2004 cut in the helicopter budget was now hurting British efforts. "Now, when we need more vital equipment, the cupboard is bare," said shadow defence secretary Liam Fox. "No amount of evasion and creative accounting can disguise the fact that our troops are being let down." The Lib Dems said ministers had "failed to respond" to clear evidence that helicopter numbers were inadequate. Former leader Sir Menzies Campbell told MPs he believed the government had "failed" in its duty to protect soldiers in Afghanistan and had "exploited their loyalty". He said public support for the war was "finely balanced" and could easily "fracture". The outgoing head of the British Army General Sir Richard Dannatt revealed this week he had been flown around in an American Black Hawk helicopter because he did not have a British one. Professor Theo Farrell, of the Department of War Studies at King's College London, said the MoD had bought seven Merlin craft from Denmark when a shortage arose during the Iraq war. But he added: "It's not just about buying more helicopters but training more aircrew and ground crew to operate them." Ahead of Thursday's Commons debate, the prime minister and Mr Arbuthnot clashed during Mr Brown's appearance before the Liaison Committee of senior MPs. Mr Brown said he could not reveal the number of British helicopters in Afghanistan for security reasons. But he denied cuts in the defence budget alleged by the Conservatives had resulted in a shortage of helicopters. "We have spent the right sums of money and we are prepared to do more to ensure our troops are properly equipped," he added. Mr Arbuthnot asked the prime minister whether military commanders had recommended earlier this year that an extra 2,000 personnel be sent to Afghanistan but that the request had been turned down. Mr Brown said a "variety of options" regarding troops had been discussed. He added there were now 9,150 British personnel in Afghanistan and there had never been a recommendation for increasing this to more than 11,000. After Mr Arbuthnot suggested that Mr Brown had not answered his question, the prime minister said it was "wrong" to suggest the UK did not have the troops it needed to do the job. "The troops that are necessary for the mission we are engaged in now are there," he said. "I am sure we have done our best by the troops that are on the ground at the moment." BBC political correspondent Ben Wright said Mr Brown's answer was unclear because he did not say when the conversations with military chiefs took place and how many troops had been in Afghanistan at the time. An offensive designed to increase security ahead of Afghan elections next month has seen a big increase in UK casualties, with 15 servicemen killed in the first 10 days of the month. It means 184 service personnel have now died in Afghanistan since 2001, more than the 179 who were killed during the war in Iraq.